Honestly, looks like a cheap Halloween costume. She looks hot in it, but then again girls tend to look hot in those Halloween costumes. Not at all what I was expecting/hoping for. ... it's like she walked of the set of a Power Rangers episode. Very good analogy. The whole thing just looks fake. Nothing very realistic about it. lol You're right. As soon as I opened that I was like "crap, that does look like some 'model' you'd see on a site selling cheap costumes". Just looks too cheap and cheesy. Something I'd expect as some fan-made costume for ComicCon or something. I dunno man. I think ComicCon costumes have more heart than this Halloween Superstore costume. Very true, some of those Comic Con costumes are ridiculously awesome. Believe me, I've been to a few of them. Not all are great, but many are very meticulous. Oh and CobraKai, your screen name brings back so many memories! What were you expecting or hoping for? It's not like Wonder Woman's costume was laced with gold or anything of any spectacular nature. She does look good though....DAMN! - The cloth elements that look more like cloth/leather than cheap, glossy latex. - If they went with full pants, something other than a full leg of bright blue. This looks like something I'd expect from a Power Rangers spin off, aimed at children under the age of 12. This is not a prime time show look or feel. Even the WB Smallville costumes are better looking than this. EXACTLY what Im trying to get at. There are so many awesome variations of her costume, and so many of them are pure sexyness....this is just why? Those are fantastic examples! Perfect for what they should have gone with. Something that looks realistic and not too campy. That would have worked much better. Very well put. It definitely should (and could) look more realistic and professional. Definitely doesn't have that prime time look or feel as you so accurately put it. She looks good in it but that costume is TERRIBLE! How about the good Wonder Woman that shows off more skin? You know like the JL cartoon. Show more stomach, make the pants shorts, and keep the extended long boots. Also change the blue, looks cheesy. And whats up with the super bright lipstick? You know, I didn't really notice the lipstick until you said something, now that's all I can see. I can live without the more revealing aspects of it, but it doens't have to look like crap either. I'm not sure actually what I was looking for. The costume just looks cheap and Halloweenish. Something on par with what you'd see in a cheap fan film, not a professional TV show. Who knows, things do look different in the movie lighting and in motion, so perhaps it's not as bad as I think. I tell you though, she could lasso me up anytime she wanted to! I feel bad for the sound designers. They're not going to be able to use any of the on-location sound with all the squeaking that suit's going to produce. 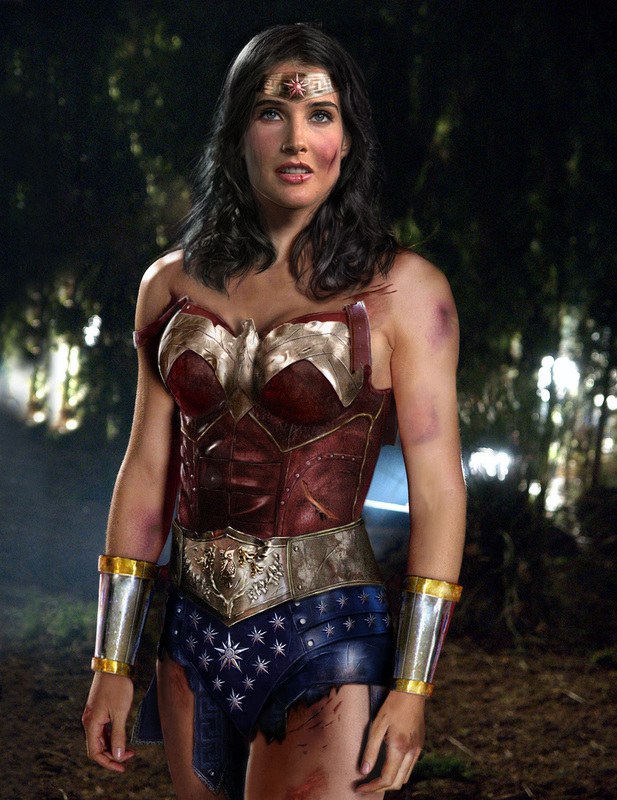 My Biggest problem with this new series is that it looks like it takes place years ahead in here career, I personaly thought when they were going to start a new series they would start at the begining of here career much like the way Smallville started, that way we could have got wonder woman in a more original costume. Will some one explain to me why I lost 2 bubbles on one post, if you disagree with what I said just say it to me, or was it because I mentioned Smallville because it seems to me some people just like to complain at the slightest comment of the show. You didn't lose 2 bubbles. I'm assuming by your comment, that you came from N4G and had 5 bubbles over there? Well bubble count doesn't carry over like that. New members on here start with 3 bubbles. And since you're technically a new member (only just activated your account on FilmWatch), then you start with 3 bubbles. If you check on N4G, I'm sure you'll see you still have your 5 bubbles. I assure you, there's none of that petty bubble taking for no valid reason going on over here. The costume may be bad, but the person in the costume is not WW at all. looks like they're going for something like she wore in the storyline straczynski wrote, which was almost universally derided if i recall. still, it could have been worse, one thing i would change though is to give that top some straps, as it is it looks like she could burst out at the first whiff of a fight right now. anyway, it's good to see wonder woman get some attention outside the comics for a change, nice to see any of the female superheroes actually, they rarely get much attention outside the comic books. That's a point I've made several times about this series. With your name, I take it you're female? NBC and the studios behind this have an excellent opportunity here to do some real good for themselves. In general, the comic book genre is comprised of male fans. I think this is largely because females don't really have prominent characters to serve as "role models" or whatnot and thus aren't drawn in. If they do this proper, they can make a strong prominent figure for the female audiences and thus draw those females in, really expanding their audiences. Probably, but I'm hoping they do it right. If for no other reason than they're own sake with the potential to bring in a whole new demographic by finally having a prominent and legit female superhero that gets plenty of attention with respectable material. Is this the finished look, I mean it is possible they will update it and of course it will look slightly different on film as opposed to still images. With a bit of editing and work it can look okay. That's part of my hope too. I'm not sure they'll update it, but maybe they plan to do some post-editing to the costume to make it look better. Plus maybe with the lighting and all it could hopefully look better when actually filming. Yeah, I think at times these costumes need to be bright and flashy, so later after editing they still look good. I still hope they can tweak it a bit. Indeed, just doesn't look good. If the show turns out anything like this costume, it could possibly be really cheesy and just cheap/unprofessional looking. i'm willing to give it the benefit of the doubt, but it really isn't looking too hot from a design standpoint. Not really what I was hoping for but I'll still check it out... Maybe they'll add extra details to the suit after filming as they do with other films and TV shows lately. 6 episodes. It'll make it 6 episodes.